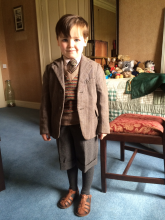 Wondering if young Roger Wakefield would be in the first season of Outlander? According to this report from his school, Rory Burns played young Roger Wakefield for at least one day. Roger Wakefield is the adopted son of Rev. Wakefield who is played by James Fleet. For the non-book readers, the character of Roger Wakefield does not become important until the second book, Dragonfly in Amber. The description of his day on his set is very cute. Filming took place at Hunterston House in West Kilbride. Much to Rory’s (and his very proud Mummy’s) excitement not only was he picked up and dropped off by personal limousine, he had his own trailer. This entry was posted in Production News and tagged Casting, Roger Wakefield, Rory Burns by Sarah Ksiazek. Bookmark the permalink.